The freshly restored windows were unveiled at a public celebration on Thursday. While the work officially began in 2016, UNB Art Centre director Marie Maltais had been searching for a qualified conservator and raising funds since 2011. Essential to the project was a stained glass artist who had the knowledge and expertise to work with old glass on an architectural scale. Miraculously, stained glass artist Ned Bowes calls the Fredericton region home. Mr. Bowes, who was awarded the title of maitre de vitreux, or master of stained glass, from the American Stained Glass Institute in 1980, has almost 40 years of experience working on large restoration projects around North America. He dedicated his vast knowledge and exceptional skill to bringing UNB's signature stained glass windows back to their original glory. "All of these windows are just oozing with knowledge, with history," said Mr. Bowes. "There's a message in every window and it's there for the person looking at it. "Stained glass windows at one time were referred to as a poor man's Bible, when many people were illiterate. Someone can look at a stained glass window and take away their own understanding of the message." 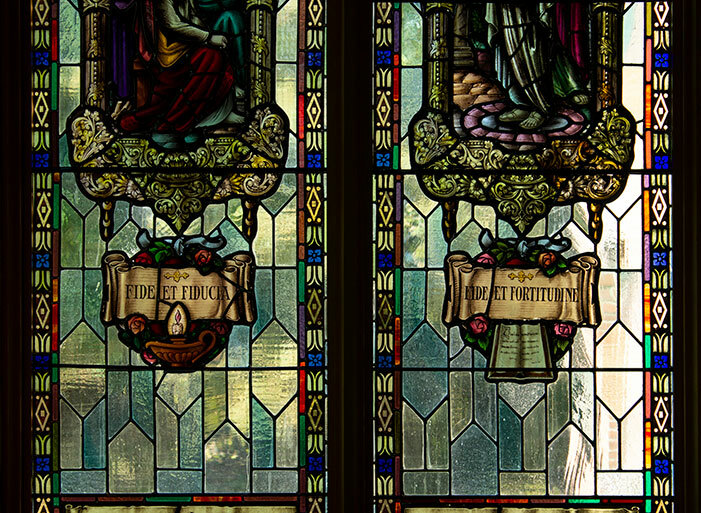 The seven stained glass windows were installed between 1926 and 1943 and are dedicated to fallen soldiers, literary figures, former UNB professors and prominent New Brunswickers. They feature family crests, mottos, insignia and images from history, poetry and science. Some of the original windows had been too large for their frames and needed to be chiseled out. Others had holes that were patched up with cement, covering entire sections of glass. On one particular window, Mr. Bowes spent 200 hours restoring it. "The windows tell the stories of those long gone," said Ms. Maltais. "They have the power to inspire and to challenge. They make visible art connections to the past." A public exhibition detailing the painstaking restoration process from start to finish will run at the UNB Art Centre in Memorial Hall until Nov. 9.